The region of Lombardy (Lombardia in Italian) is located in central-northern Italy and is the country’s most populous, prosperous and industrialised area. At the heart of the region is Milan, Lombardy’s principle city and the capital of Italian finance and fashion. Alongside the throbbing business of Lombardy there is also a successful wine industry producing diverse and often prestigious drinks. 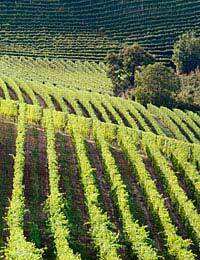 Whilst most of Lombardy’s agricultural production is food focused and its wine is less well respected than thise, produced in neighbouring Piedmont, Veneto and Trentino, there are some highly respected vineyards. Both established growers and newcomers make distinguished wines in almost every part of the region, but traditionally Lombardy wines are associated with three principal areas found on the borders of the region: Oltrepò Pavese in the southwest corner near Emilia-Romagna; Valtellina in the north, close to the border with Switzerland; and Franciacorta, the most important of all Lombardy wine areas, found in the east near Lake Garda, famed for its sparkling wines. The Oltrepò Pavese, which means beyond the Po River, has a long tradition of excellent wines. Often wines from this area have been unfairly dismissed as suitable for quaffing and little else, perhaps due to their easy drinking, rustic nature and modest prices. Traditionally wines of the Oltrepò Pavese are sold relatively cheaply in countryside taverns along the banks of the Po and Ticino, and this may have added to the false impression that these were inferior to other Lombardy wines. Recently, however, these wines have started to acquire well-deserved recognition both nationally and internationally. Valtellina is in the far north of Lombardy, in the foothills of the Alps. Grapes are grown on cold yet sunny slopes, notably Nebbiolo grapes of Barolo and Barbaresco fame, which takes on a mountain-cooled, almost leathery edge in this climate. Sforzato (also labelled sfurzat and sfursat) is an unusual wine made in this area, using Nebbiolo grapes that are dried before fermentation, lending a softer mix of sweet and savoury flavours. Franciacorta, in the eastern province of Brescia, is the most important Lombardy wine area with its rich reds, fine whites and exceptional sparkling wines. Spumante (sparkling wine) is made all over northern Italy, but Franciacorta is the country’s leading producer of sophisticated dry sparkling wines made using the Champagne method. Amongst the many wine makers in the area is Berlucchi, arguably producers of the best Italian spumante, who’s pioneering success in the 1970s made Franciacorta, Italy’s answer to Champagne. These wines made using chardonnay, pinot noir, pinot grigio and pinot bianco grapes, and are characterised by an elegant fine mousse of bubbles, similar to their French counterparts. Berlucchi and other well established estates including Ca' del Bosco and Bellavista are recognised national leaders in quality and prestige. ‘Franciacorta Brut Casa delle Colonne Millesimato 2000’ is a dry spumante from the famous Berlucchi estate. This elegant straw yellow wine, as with all Italian spumantes, is particularly good paired with sweet cakes. Spumante is associated with luxurious parties, weddings, and other celebrations. Lombardy is also home to Panettone, a speciality sweet cake eaten at Christmas. It is also known as ‘pane dei signori’ (lords’ bread) because in the past only the rich ate it. So a splendid combination for a special occasion is Panettone washed down with a Franciacorta Brut. In the Lombardy city of Mantova one can eat the local ‘Risotto alla pelota’, a local dish of rice, salamella pork and parmigiano. An ideal partner for this risotto is a ‘Lambrusco Mantovano Borgo Imperiale 2000': Vinicola Decordi del Borgo Imperiale’, also from the same city. This award-winning sparkling red has a distinctive nose that is intense yet refreshing. Lombardy is a region that is as diverse in geography and history as it is in its wine, and is gaining a deserved reputation as one of Italy's most dynamic viticultural zones.